The group began the day studying LIDAR images and maps of the Sabden area in the Green Room. The proposed location of the Craggs vaccary was discussed. With the weather improving, an intrepid group braved the mud and the streams to visit the Craggs above Sabden. The purpose of the visit was to ascertain whether features of a vaccary are visible in the landscape. The opportunity was also taken to discuss previous Craggs excavations and fieldwalks. Accompanied by the lark ascending, or two according to Alan, the walk started at Clitheroe Road. Calf Hill was clearly visible below the mist, along with its ditch and bank feature. A slight detour was taken on a higher footpath which gave us a bird’s eye view of Badger Wells Water. We then followed the footpath to join the track to the Craggs. The Craggs site was found to be free of nettles and bracken. As a result the outline of Little Craggs Farm was visible. 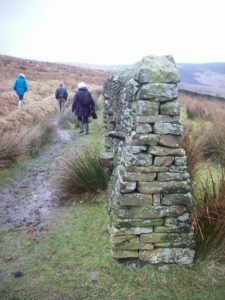 The stone lintels and gate posts of Great Craggs Farm were a great source of discussion. Some roof beams were also studied. Having explored the ruins of the farmhouses, we returned to the footpath around Calf Hill. 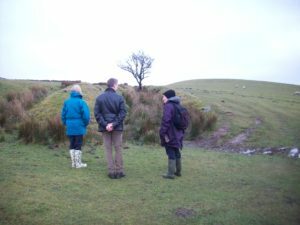 A chance meeting with the landowner allowed us the opportunity to view the ditch and bank feature at the base of Calf Hill and the ditch feature at the top of Calf Hill. Water supply Badger Wells Water was in full flow running along the western side of the proposed vaccary summer pasture. There is also evidence of water management with a culvert running underneath the track. The culvert is constructed using a dry stone wall technique. It would seem to predate the use of clay pipes and looks to be high status. 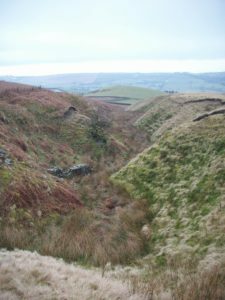 The landowner informed us that there is a matching culvert at Craggs. Transport The site would have been well serviced by the King’s Highway. In addition, a metalled surface can be seen on the track approaching Great Craggs Farm. Field boundaries There is evidence of stone walls of different dates. The first photo shows a straight sided wall with a wide top and an overhanging coping. Studies have found that these can be correlated with walls which documentary research shows existed in the late medieval or early post medieval period1. The second photo seems to show a wall from the late 18th century. This wall respects the bank and ditch feature. There is also a variety of gate posts of different dates. The evidence points to the use of the land over a long period of time. Arable field Faint traces of ridge and furrow can be seen in a field above Great Craggs. This is a possible site for the vaccary arable field. There are several features which seem to point to the location of the vaccary at Craggs. It would seem that most of the potential evidence for the possible summer pasture of the vaccary will have been erased by Churn Clough Reservoir. However, some early features may survive and will need further investigation through survey and excavation.